I’ve now lived in Germany and worked with German keyboards long enough that I regularly switch my laptop keyboard to the German layout. Because otherwise, I make too many mistakes, misspelling my surname for example. I can now type faster on the German keyboard layout. Still, there are a few instances where I switch it back to the English layout. One is for typing in programming languages. I’ve got the German layout memorized and never got the stickers, but several keys essential for coding are just not as accessibly located in that version: greater/less than signs and forward and back slashes. I have dedicated the last several months to making a more permanent change in location within Germany. As an “alien”, this change process is not the easiest. The main takeaway is to never ever again try to move during the month of August. All the authorities and officials you need to talk to are on vacation and any paperwork you hand in will just sit there until the person in question returns. I’m sure there are instances where everything goes smoothly, but for some reason I’m hitting every bump in the road. On the bright side, I’ve got some extra time to spend on my projects. My new room is beautiful, but I need curtains. Since I’ve got the extra time, I decided to sew them myself. I had the pieces cut to the right size at the shop and have now begun sewing them. 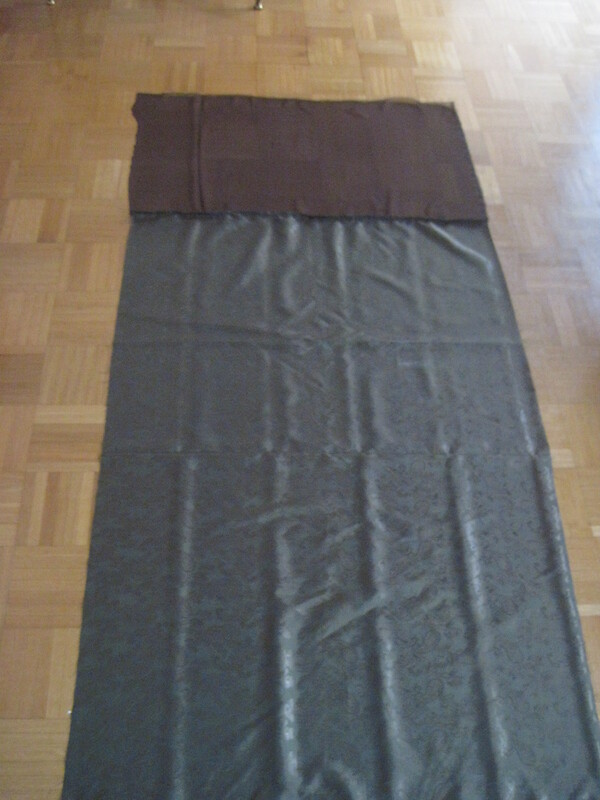 In order to let some light in, the top 50cm are a brown chiffon. The main bit is a dark green-brown-gold paisley (see above). Thus far, I’ve sewn the two fabrics together and hemmed the bottom of the one half. The light is too dim right now to do the other one, so I’ve just pinned it in place. Next, I’ll need to go out and get 5m of bias tape (dark brown) for the vertical edges, plus about 1.9m for the top (width is about 0.9m each). I’ll aim to get a wider type of bias tape for the top so that I have room to make holes for the curtain hooks. I hope to be able to hang them in two days or so. Next up are the balcony doors. I might just do the brown chiffon for those as privacy curtains aren’t as necessary on that side of the room. We’ll see, though. The last time I worked with chiffon, I learned that sewing chiffon onto chiffon is extremely annoying as the fabric is filmy and slippery, but that sewing it to another fabric is just fine. 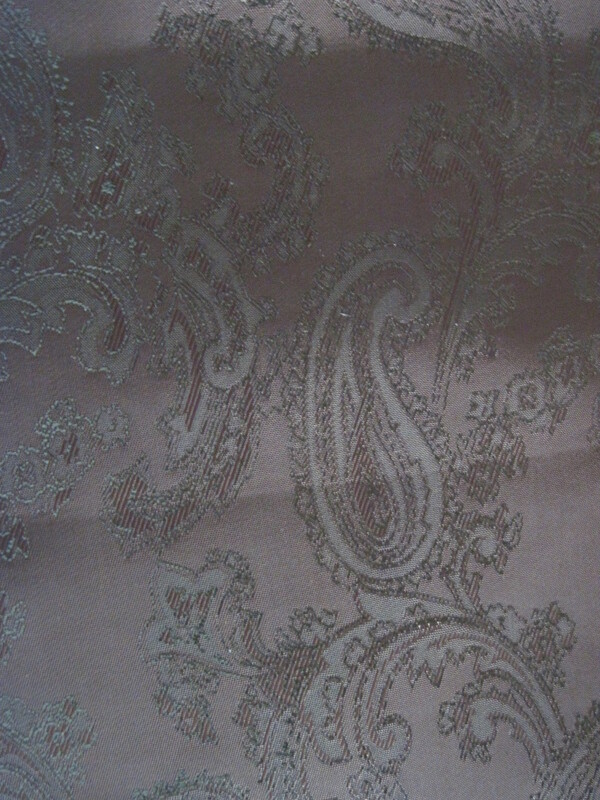 Hence the paisley and bias tape rather than hemming the chiffon by itself. Here is the back side of one half of the curtain set. Obviously, I need to iron this as well. Need to find an ironing surface.